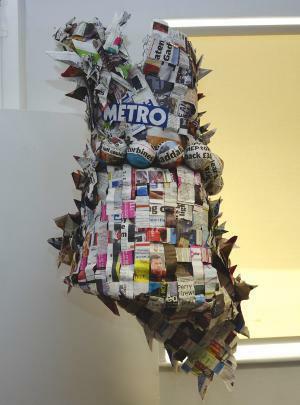 Ellen Goldie, a Leicester College Art Foundation student, bought the Metro newspaper to life by fashion! Given the task to create an innovative design Ellen decided to create a dress made out of Metro newspapers. Asked why Metro in particular Ellen said “As a free newspaper Metro brings attention to world issues and heavily focuses on environmental issues. I am big on recycled fashion, eco dyes and fair trade so to design a dress made out of a free newspaper made complete sense to me”. Roy Morgan-Wood, Lecturer, advises “Leicester College encourages learners to think about the impact of consumption and waste and the use, reuse of resources and is committed to embedding sustainable development in the fashion and footwear curriculum. The metro dress is more symbolic rather than functional and highlights the powerful role that fashion has in raising awareness of issues. Having successfully completed her first year at Leicester College, Ellen has been accepted at London College of Fashion to do ‘Contour Fashion’ and will start this October.